First, let me say, many thanks to all of you who read my posts. It is such an encouragement to know I’m not posting to a black hole! This week is another potpourri of topics. 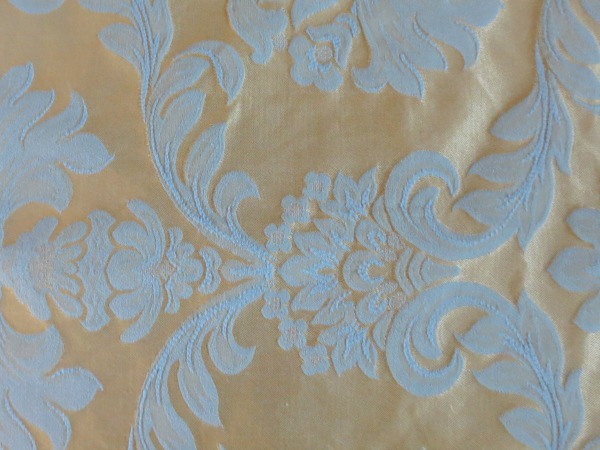 I have been defeated by the small vintage brocade fabric remnant I bought last weekend at an estate sale for a whopping $1.60. While I have dramatically reduced its musty reek, it is still not passing my sniff test. I think another vodka soak or two might make it acceptable, but to be honest I’m done with it and it’s going in the donate pile. Someone else can tackle its final restoration. In the future I will definitely inspect fabric remnants carefully. 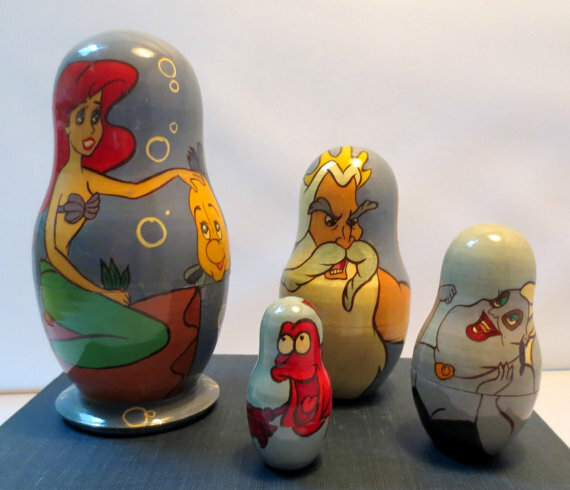 I found these wonderful “Little Mermaid” nesting dolls in Goodwill months ago and finally got them listed in my store. I suspect there may be one missing from this set as there is a big difference in size between Ariel and her dad, but they are still cute! A woman bought them today as a gift for her young sons to give to her mother, their grandmother, for Mother’s Day. That made me smile. I wrapped them and included a little note. 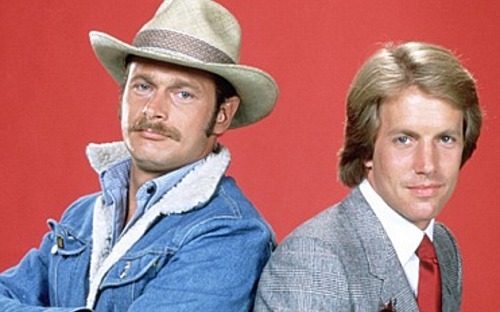 And later this morning I received an order from a name I recognized … Gerald McRaney. When I googled the actor, his city was listed as the same as my buyer! What are the chances that there are two of them in the same small LA neighborhood?? How sweet is that!! Some of you may remember him as one of the cuties (Rick) on “Simon and Simon,” circa 1981-1989. I know I do. 🙂 That’s Gerald on the left. And I loved him more recently in “Longmire” as evil Barlow Connally. And I want to give a shout out to my friends and family who have both given me things to sell (like Lisa, Ann and Tasha) and others who’ve put me in touch with their friends who’ve had amazing vintage things they’ve sold me (like Rosalie and Ann). It’s wonderful to have these connections and it’s such a pleasant way to get inventory. 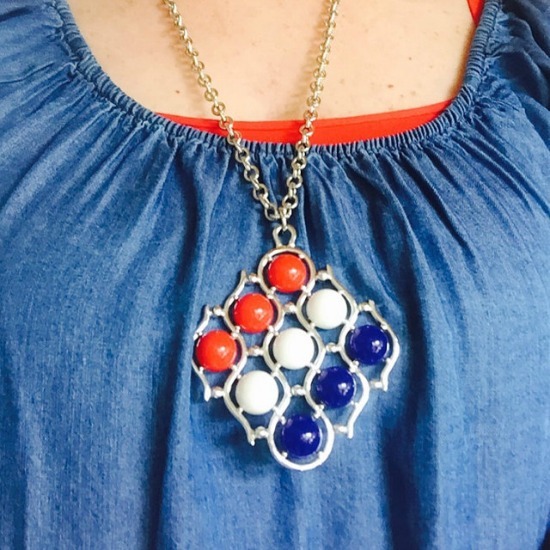 Recently one of the ’70s Sarah Coventry necklaces Lisa gave me sold and the buyer included a fab picture of herself wearing it in her review. Perfect!! Happy hunting!! Any fabulous finds you want to share?? having fun is half the fun….